Sycamore Gap is located in one of the most spectacular parts of Hadrian’s Wall in Northumberland, about mid-way between Carlisle and Newcastle. The wall keeps to the high ground but at this point there is a notch in the high ground with a steep ascent on both sides. 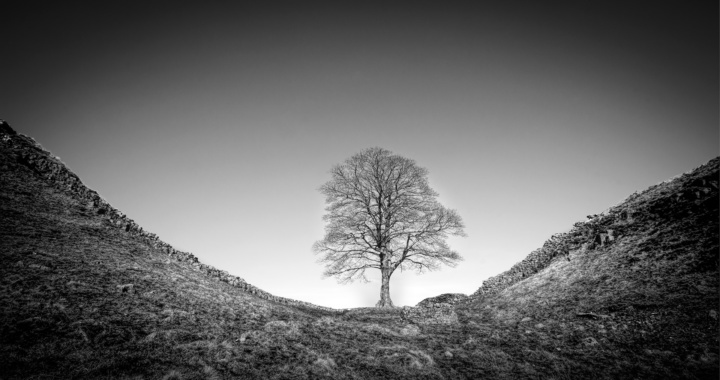 A single Sycamore tree grows in the notch, giving the pass its name. This location was used in the film Robin Hood Prince of Thieves, though in the film he was travelling from Dover to Nottingham, so must have been a bit lost to arrive at Hadrian’s Wall! Sycamore Gap is located in one of the most spectacular parts of Hadrian’s Wall in Northumberland, about mid-way between Carlisle and Newcastle. Car parking is available at the National Trust car park at Steel Rigg. This is reached about 0.5 miles up the minor road (labelled as 68 on Google Maps) north off the B6318. The junction with the B6318 is just after the Twice Brewed Inn (if heading from the East). There is no obvious landmark heading from the West, but if you reach the Twice Brewed Inn, you have gone too far! From the Steel Fell car park, the route to Sycamore Gap is very obvious as it simply follows Hadrian’s Wall! Passing through the kissing gate from the car park, the path descends south to join up with the Wall to a notch in the hillside before climbing quite steeply up Steel Rigg. Cross over the top of Steel Fell following the Wall with good views ahead to Crag Lough, before a dip to Milecastle 39. There is another climb beyond the Milecastle before the steep descent to Sycamore Gap. The total walking distance is about 1 mile. Posted in Northumberland and tagged Historical.